Do Customers Have to Pay Sales Tax on Online Purchases? Avalara > Blog > Business > Do Customers Have to Pay Sales Tax on Online Purchases? The question about whether an online purchase is taxable or not is one that hear all the time. One might think this question would be answered and put to rest. Unfortunately, like all things tax related, there isn't one clear answer. As you'll see in this post, the most accurate response that can be offered is, "maybe." Taxation on online commerce depends on many factors. Some are standard sales tax situations that apply both online and off. However, virtual commerce introduces another layer of questions. It is so easy to start an internet-based store these days that virtually anyone with a personal computer can do it. Regardless of where you happen to live in the world, you can create an online company that sells clothing, jewelry, computers, art and so much more. Customers and online sellers often assume that one of the benefits of buying and selling goods online is that the transactions are not subjected to sales tax. Let's review the things you need to know to understand sales tax and your online store. As a primer, let's talk about a legal concept called the "physical presence standard" that requires online retailers to charge sales tax on purchases made in states where they have nexus. As a result, online retailers have to track where their buyers are located and where they have operating offices if they want to comply with the physical presence standard. For example, the online retailer Amazon maintains a physical presence in Florida, Texas, Washington and a number of other states, so Amazon shoppers from these states are charged sales tax. In addition, some states have adopted "Affiliate Nexus Laws" to assist with online tax collection. Georgia, North Carolina and California, for example, have enacted Affiliate Nexus Laws, which treat cross-border sales as taxable. 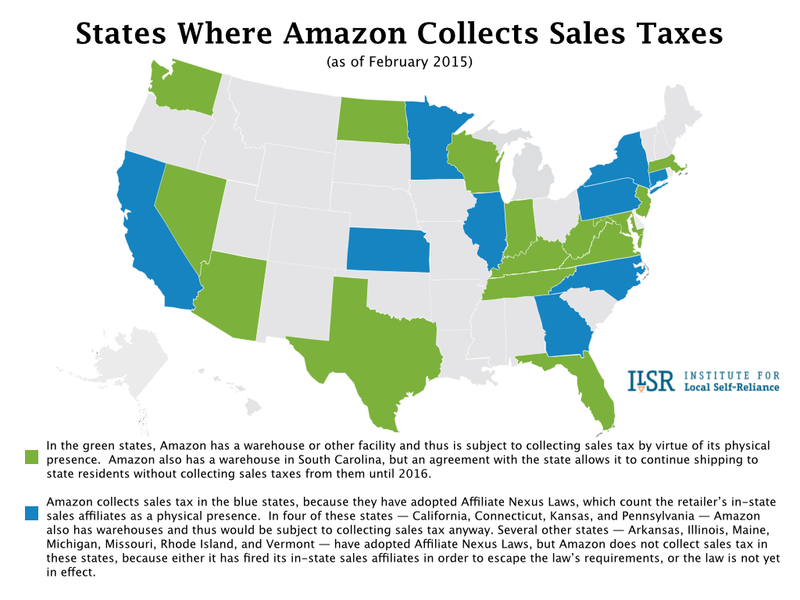 Again, using the largest online retailer as an example, Amazon charges sales tax in many states with Affiliate Nexus Laws, but not all of them. In fact, Amazon fired its affiliates in some states in order to sidestep Affiliate Nexus Laws and avoid sales taxes. Many states, like Colorado, require consumers to independently report online transactions to their state tax agencies. The consumers are then required to pay the sales tax owed on their transactions directly to the state agency. When the responsibility to pay sales tax falls on the consumer like this, it is called a “use” tax. In Colorado, online retailers selling over $100,000 in products to Colorado residents must report the total taxes due on those sales each year so the state can keep track of use taxes owed. Retailers are also instructed to notify Colorado customers that the customer is independently responsible for paying use taxes. However, not all companies do this. Since it is prohibitively expensive for states to collect use taxes on small purchases, it is rare for states to enforce use tax laws unless the cross-border transaction involves an expensive item like a car or boat. In these situations, state agencies may try to collect use taxes relating to the purchases. Exempt Items: A number of items may be exempt from sales taxes like purchases of clothing, food, prescription medications and medical devices are often exempt from sales tax. Exempt Buyers: Certain buyers may be immune to having sales taxes levied against their purchases. For example, churches, non-profits companies, governments, schools and other qualifying organizations are often exempt from sales tax. Items Bought for Resale: Items bought for resale are generally exempt. Retailers do not actually use the items they purchase. Instead, they intend to sell them to consumers, and it is only this final sale that is taxable. Use Exemptions: Items intended for certain uses may be exempt. For example, when purchased items are to be used for agriculture, industrial processing or manufacturing, and other qualifying uses, sales tax exemptions may apply. Living in a NOMAD State: Probably the easiest way to avoid sales tax is if you live in a NOMAD state. New Hampshire, Oregon, Montana Alaska and Delaware (also known as the NOMAD states). These are the only five states that do not have a sales tax. When online companies sell to people living in these states, no sales tax applies. Unfortunately, there is no way to offer a blanket solution to sales tax that covers every situation, so be sure to investigate your situation before assuming you can bypass sales and/or use tax completely.